Liverpool is fast emerging as one of Europe’s premier cruise destinations. The purpose-built cruise facility enables giants of the cruise industry, such as the QM2, to berth alongside the UNESCO World Heritage Site at Liverpool’s famous Pier Head. Few other destinations are so close to the heart of the city. Passengers disembark just a few minutes away from the main attractions of Beatles Liverpool. Contact us if you are visiting Liverpool on a cruise and we can help you make the most of your day. The club opens early when a cruise ship is in port to welcome visitors from around the globe. Come in and take a look around and maybe buy a souvenir of the most famous music venue in the world! 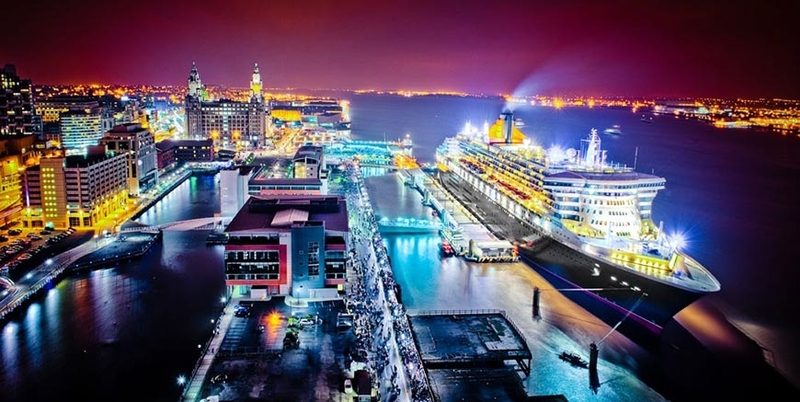 The cruise liner terminal is just a few minutes walk from the Albert Dock which is the starting point for the Magical Mystery Tour. The tour lasts 2 hours and takes you on a journey to discover the real Beatles Liverpool, houses where they lived, their schools and favourite hang-outs. You’ll also seee up close the places that inspired them to write ‘Penny Lane’ and ‘Strawberry Field’. We can also arrange a private tour for you with pick-up and drop-off at the ship.